Import QuickBooks Data for Excel will import and format monthly Profit and Loss data from QuickBooks without having to re-enter it. Using the Profit and Loss data imported from QuickBooks, the program will compile a flexible Profit and Loss layout in Excel allowing to select the amount of detail displayed. The data can be used for budget formulation and if desired to create a file (Imp.iff) that can be imported back into QuickBooks to automatically set up a budget. 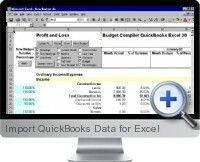 Applying existing data in a flexible and easy to read layout with the capacity to automate budget creation provides substantial benefits by integrating QuickBooks with Excel. Display view options include by Month, Quarter, and Full Year with Current Year, Last Year, and Budget values. Charts display both Actual and Budget values.